However you spell Peony you will still be captivated by this family of Northern Hemisphere perennials. Lush flowers and foliage are a major attraction but there is also the opportunity to study and become involved in more detail with a concise family of interesting and often endangered species. 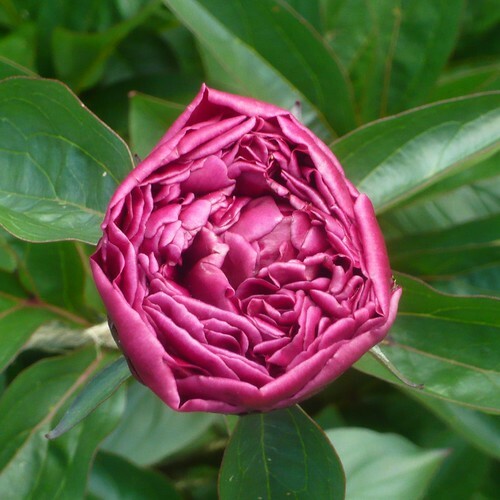 Peony Society is the place to start an academic study of the subject but getting your hands in the soil with a couple of good plants is even better. 1. To promote peonies as garden flowers. 2. To publish a quarterly newsletter and annual journal. 3. To stimulate scientific research on peonies. 4. 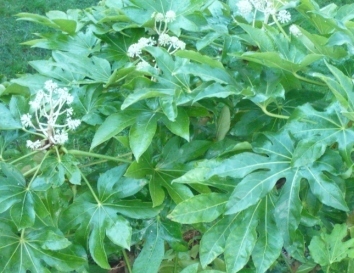 To encourage the conservation of wild peonies and old cultivars. 5. To organise visits to gardens and to see wild peonies in their natural habitat. 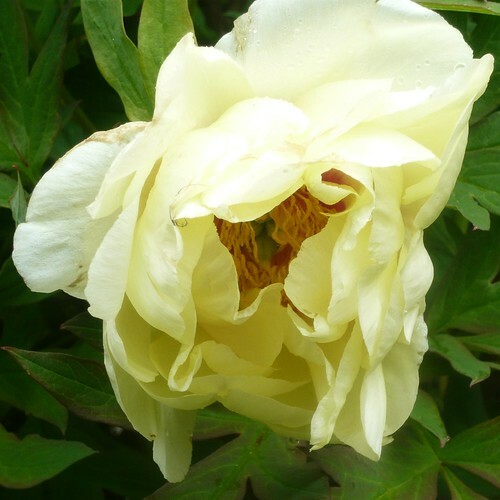 There is a german data base of Paeonia, the only genus in the flowering plant family Paeoniaceae with a vast number of hybrids and photographs. Clair Austin supplies Peonies and has some good tips on Tree Peonies which are my current favourite plant. 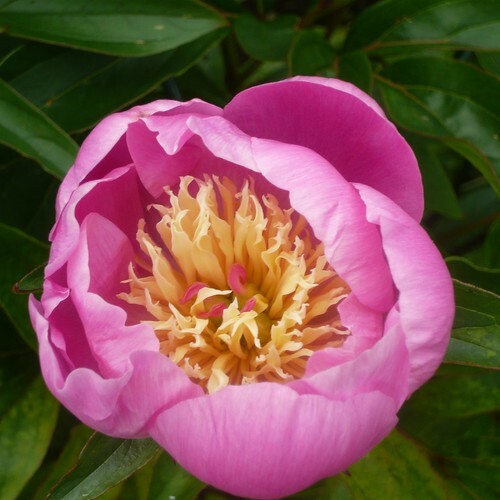 Here is a list of some Tree Peony varieties they have available. 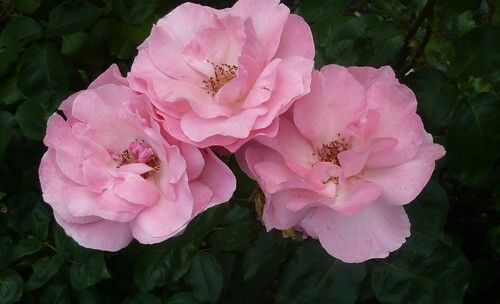 Floral Rivalry’ (‘Hana Kisoi’) Gorgeous scented, deeply cupped flowers of light cherry pink. Each petal is darker at the base and curls around a centre of loose stamens. ‘Host of the Cherry Blossom’ (Yae zakura) Attractive double to semi-double soft pink flowers. The petal edges pale with time. ‘King of White Lion’ (‘Hakuojisi’) Magnificent semi-double pure white flowers of great size that are produced with great freedom. The base of each petal is smeared with purple. An easy variety to grow. 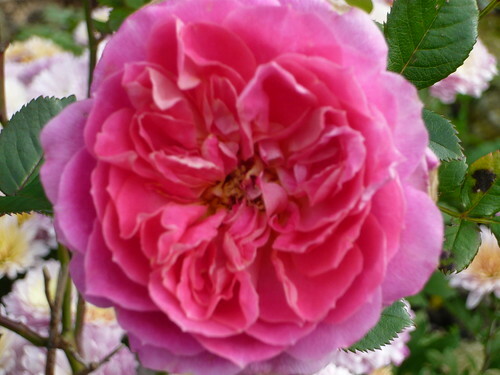 ‘Shimi cho jamata’ (Long Life) A very beautiful variety with satiny lavender semi-double flowers. Almost black flares at the base. The flower forms an elegant cup and are are borne upright on the shrub. ‘Argosy’ The first lutea hybrid to be introduced. The single flowers are soft yellow , cupped and flushed with crimson at the base. 90cm (3ft). 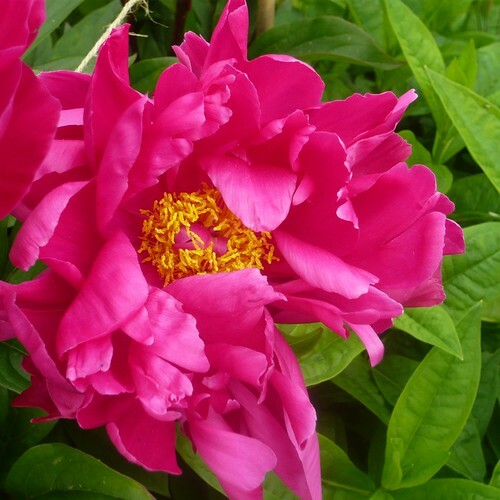 For centuries Peonies have been great favourites of the Chinese and are one of their national flowers. Peonies are easy to care for once established. 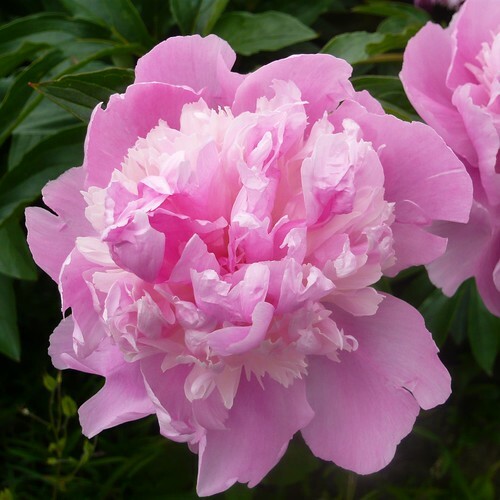 Peonies are shrubby herbaceous plants that will come back perennially (year after year). They can live 75 years and still produce a brilliant profusion of flowers. Herbaceous means the leaves and stems die back at the end of the season and new growth will start again in Spring. Flowers are often strongly scented to attract bees and have double or single blooms. The colours are deep red through pink to white. Peonies do not like to be disturbed or moved once they are planted. Because they will live in the same spot for many years add some bone meal and good compost at the bottom of the planting hole. Plants are hardy but may make take some time to flower. Only plant Peonies at the same depth as they were grown, never deeper. Tree Peonies are harder to grow successfully and cost more to buy but can have show stopping displays of flowers once they mature. Peonies make a great herbaceous perennial which can be relatively low maintenance and provide great blousy blooms – excellent for cut flowers during the summer months. Peonies like full sun in an open position. Some shade is fine, but, it must not be full shade. They may need watering in the spring when the buds are forming. If the soil is too dry, they may not flower. A light dressing of manure in autumn or general fertiliser can help, but, generally they are not too fussy. They are relatively slug resistant ! They are relatively disease free if given space to grow. The problem with Peonies is that the blooms become quite heavy and will fall over in a rain shower. They will need careful staking to remain upright in the garden. I must start using the current name for my Peonies. Whilst this and the next picture are correctly named I should record the variety names on all my photos. Peonies look good when photographed as square pictures. Gardening is an area where there are many ways of saving money or reducing costs. A thrifty approach to gardening is not only possible it is highly desirable particularly in the early stages of gardening. It would be easy to buy the most expensive and decorative plants in the garden centre only to find that you didn’t know what you were letting yourself in for. The plant may die or fail in some other way because you didn’t understand its needs and the care required to look after it. So ask for advice. Increase your own stock by collecting seeds from annuals and plants you like. Leave a few vegetables to ‘run to seed’ e.g. peas and beans are good examples – at the end of the season let them grow until the seed pod is mature then collect and separate to dry the beans or peas and sow them again in spring. Increase your own stock by taking cuttings. Don’t worry about the occasional failure but take enough cuttings to cover losses. Increase stock by dividing up large clumps of plants. Many plants like Iris need this division treatment to remain healthy. Local horticultural and gardening clubs, neighbours, church fairs, friends, and family are good sources of cuttings, seeds and cheap but healthy plants. Look in your own garden for self sown plants I had some great cowslips in the garden when I arrived probably from seeds dropped by birds. Water is costly when metered so mulch rather than water. Water key plants individually and deeply. Collect rainwater in a barrel. Make your own seed pots from old packaging, margarine tubs, yoghurt pots or paper towel roll ends. If you have several old marked labels clean then in a jar of bleach to be able to reuse. Use organic slug control methods which tend to be free or cheap. Grow what gives you pleasure but if you can eat it or use it instead of buying something, like a bunch of flowers or present then you will get double value & pleasure. The best Foxtail Lilies can grow to 7 feet tall and form clumps of outstanding spires of star shaped flowers with showy stamens. Eremurus robustus only flowers for three weeks or so, but for that brief period it can be the star of any garden. Eremurus stenophyllus has bright yellow flowers with orange tiped stamens giving a two tone effect as they mature. The plant looks spectacular in prairie style planting and has earned an AGM. Eremurus Ruiter hybrid ‘White Beauty Favourite’ has tapering blooms that can last for several weeks as cut flowers. Eremurus cultivars such as Cleopatra can have orange or peach coloured flowers. Eremurus needs good drainage, full sun and a cold snap in winter to induce flowering. Shelter from strong winds to protect the tall blooms. The root system is fascinating with a central growing point which is encircled by fleshy, finger-thick tapering roots. These should be planted in a shallow hole but on top of a mound of sharp sand. Foxtail Lilies grow away quickly in spring, forming a rosette of bluish-green strap-shaped leaves up to 4ft high, from which the flower spike rises during late April to flower in May. The flowers open progressively from the bottom of the spike. After flowering allow the plant to die back and remain dormant until next spring. Use a mulch that stays fairly dry such as shingle or bark and this can protect new growth from frost. 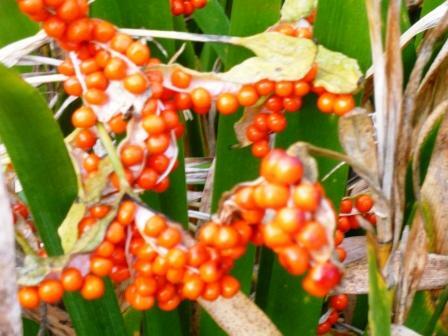 To help Foxtail Lilies self-seed, leave the flower spike standing into autumn and the seeds will ripen and drop. Hellebores are doing very well this year. The combination of the last cold winter, warm spring and now wet winter again has brought out the flowers in profusion. 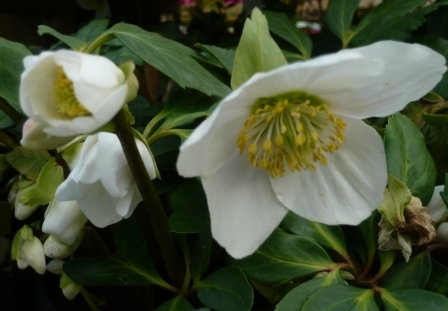 The Niger or Christmas rose is one of the earliest white flowers but many hybrids are now available. Buy plants in flower so you know what colour you are getting. Hellebore is very promiscuous and plants grown from seed may be crossed with other less suitable plants. What is a Patio Rose if it isn’t a rose grown on a patio? Patio roses grow bigger and bushier than miniatures and are about 14 -24 inch high, yet they are perfectly formed. H.T. 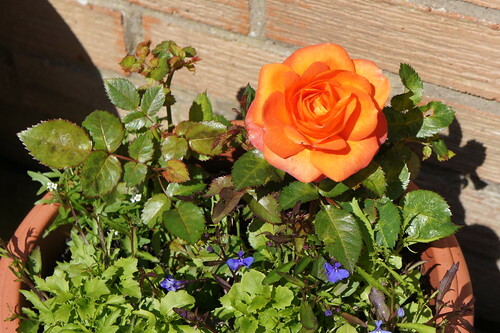 Bush and Floribunda roses grow bigger but Patio roses are easy and decorative. 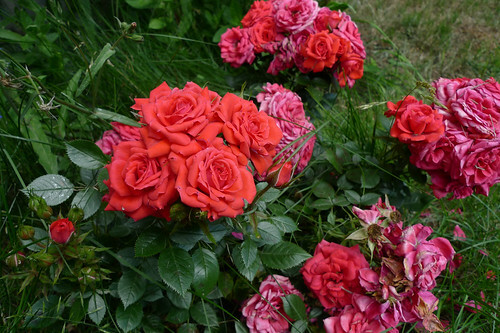 Patio Roses are easy for growing in small spaces and can be useful in many other garden locations. They can be grown in containers and pots or just planted near your front door. Edging plants in front of other plants or in a narrow border on their own. Some varieties make an attractive small hedge. They all look well planted in groups 3-5-7 of each variety. They are not house plants and are as hardy as larger roses. Patio Roses are great for tubs and containers but remember to feed, water and mulch them. Combined with summer bedding plants they will flower all summer long. Minimum pruning in late February or March will help keep them tidy. Plant in full sun for the best show. They are of course totally hardy and being perennials will appear year after year. Roses are outdoor plants and do not survive in the house. Golden Anniversary Large fragrant golden rounded flowers with yellow centres from summer to autumn. Upright bush habit. One of the smaller varieties is not surprisingly called Peter Pan. There seems to be a named patio rose for most birthday and anniversary event if you shop around – that is modern marketing for you. 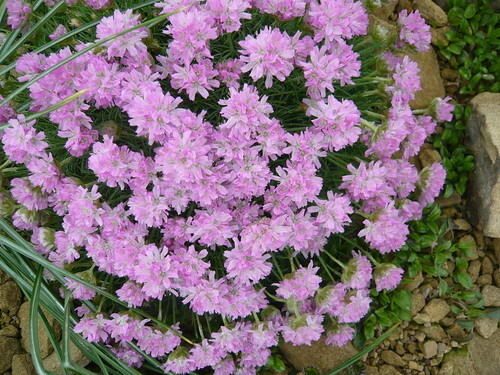 Armeria maritima has many local names and is also known as Sea Pink, Cliff Clover, Ladies’ Cushions, Heugh (or cliff) daisy, Armeria juniperifolia or Marsh daisy and Sea thrift. The colour of the 1″ ball shaped flowers varies from white Alba through pink and mauve to dark red. The clumps of dark green foliage form good mounds useful for contrast of shape in a rock garden. The densely packed grass like leaves are up to 5 inches long. Thrift is a perennial but if it browns in the center split the plant. 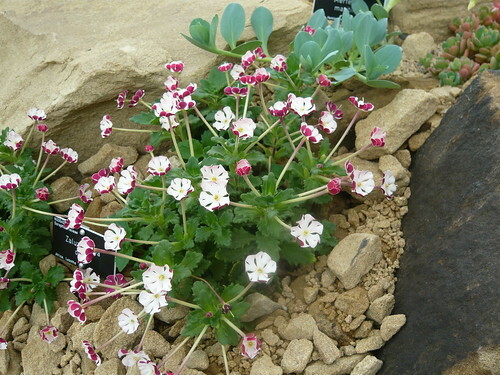 Thrift grows well in dry, sandy soil or low fertility soil. It is very salt tolerant hence its appearance as a wild flower along the coast. Take basal cuttings in summer or divide large clumps in Autumn. They need full sun all day but can tolerate dry, windy conditions. Thrift flowers in spring through summer. Remove spent flowers to encourage more blooms. Splendens is the best Pink variety. Zaluzianskya provide more plants from the South African range of flora. 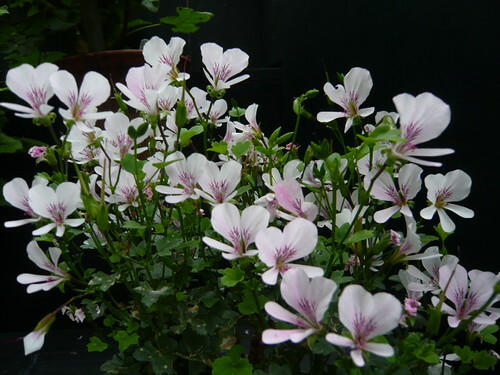 It is a compact plant that seldom grows to more than 6in across and just a few inches high. They have aromatic, evergreen foliage that forms a dense, neat dome. Growing one foot high Euryops acraeus or Euryops evansii is a dwarf shrub that makes a neat and compact plant. In summer the grey mounds of leaves are covered with small bright-yellow daisies that have an even deeper-yellow in the centre. It is a tough plant that survives all but the most extreme summer conditions including moderate but not prolonged drought. It can rot if too wet and unfortunately it isn’t reliably winter hardy. Propagated by stem cuttings that can be overwintered inside. They are being promoted by the horticultural trade and are progressively available at garden centers in the spring so expect to see more around. Other Euryops, and there are around 100 species, can grow into small trees but due to winter frailty I can not recommend any varieties. 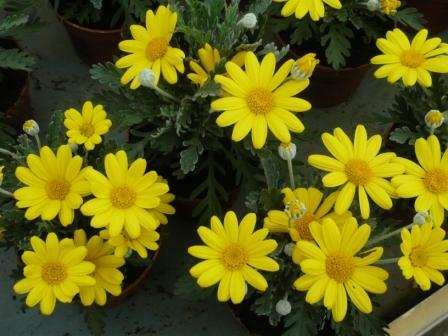 Euryops look good in groups of 3 and they are a suitable filler for cottage or perennial gardens. If your garden can use a shot of bright yellow all season long then give Euryops a trial.